(In a jar!) We couldn’t let St. Patrick’s Day slip by without a nod to the great patron saint of Ireland. 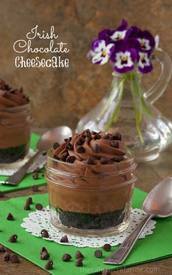 And what could be better than to salute the Emerald Isle’s grand celebration with …… Irish Chocolate Cheesecake! I’m quite sure you’ll agree. I made these Irish Chocolate Cheesecakes in individual size servings using small jelly jars, in order for my guests to serve themselves.